Happy Friday!! Here to welcome the weekend is Kiki from Kiki Creates. 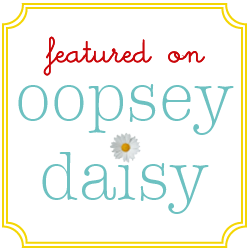 I adore Kiki's blog and her fantastic etsy shop. I simply can't believe the inspiration that has come out of this Summer Camp series! I am learning about even more children's books than I knew existed! Kiki is sharing some absolutely adorable stuff today! Hi everyone! 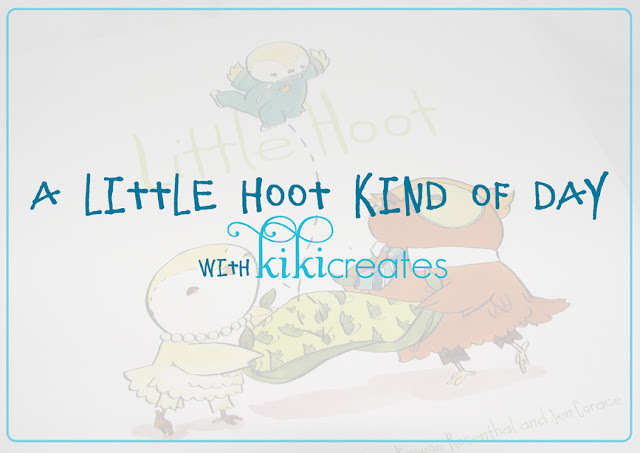 I'm Kiki from Kiki Creates and am super excited to be here for this series. 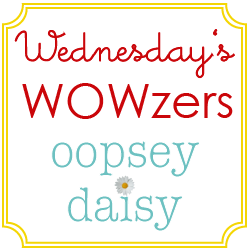 Oopsey Daisy was one of the first blogs I came across while blogging, so it is an honor to be here! 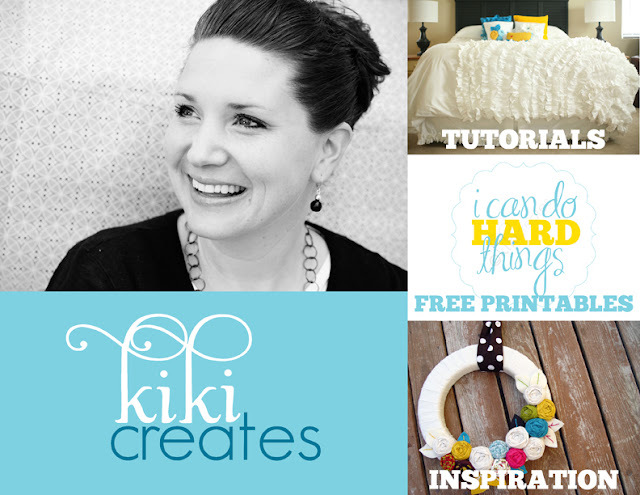 Kiki Creates is a blog filled with tutorials,free printables and the inspiration where it all comes from. I keep myself busy with my blog and etsy shop, but my greatest excitement and love for life come from raising my 3 little munchkins and being a wife to the best husband on earth. I am so excited to show you the incredibly fun day my kids and I had recently all based on the book "Little Hoot" by Amy Krouse Rosenthal and illustrated by Jen Corace. Have you ever read a book and said, "I want to have that day with my kids?!" This is exactly what I wanted to do! 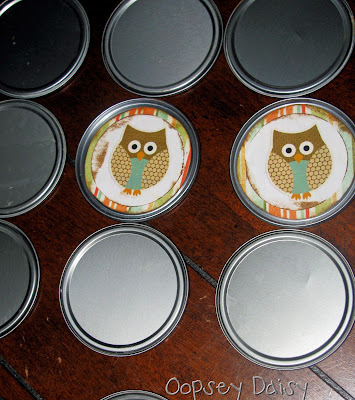 I had several questions about the owl counting cards that I used during O is for Owls Week. 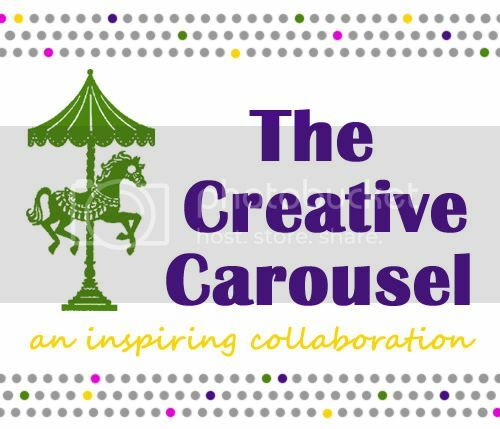 I have to admit that I am a bit of a sucker for digital designer Crystal Wilkerson. Anticipating owl week, I bought her adorable owl rub-ons and stickers using a bit of fun money. I used them for TONS of projects and have plans for even more, so I think I am definitely getting my money's worth! You can buy your own set here. I thought I would share another quick and easy activity I made using this awesome kit! I love repurposing trash! I now collect frozen juice lids, among other things. 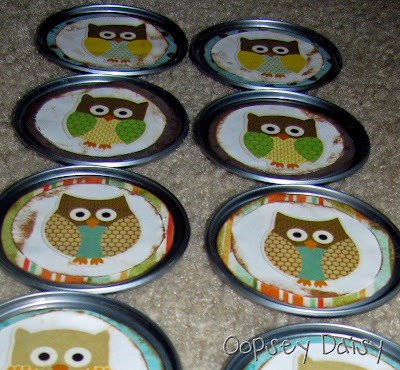 I used these frozen juice lids to make a little owl matching game for Little Man. This is definitely an advanced game because the owls vary by colors and pattern. I also used the same kind of background paper for each matching set so that would help identify a match. We used this a bit last week, but he will grow into it even more as he gets older. I just printed off a bunch of these adorable owls. 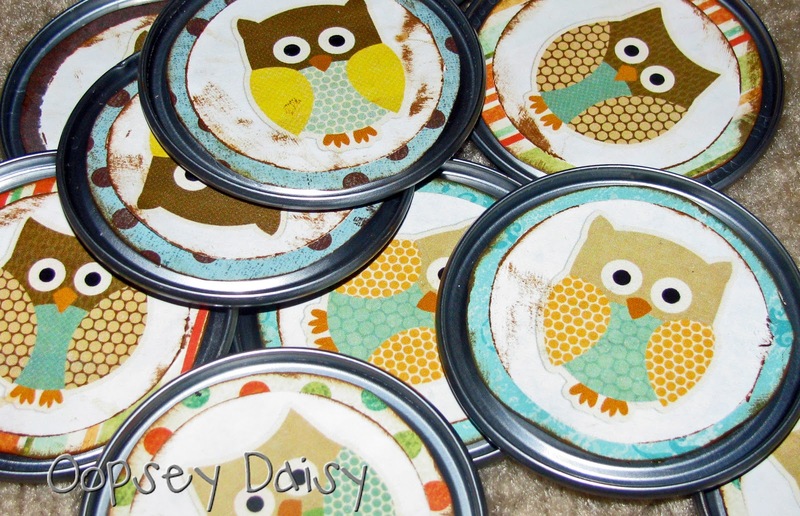 I used my 2" hole punch to cut them out, and mounted them on scrapbook paper circles. 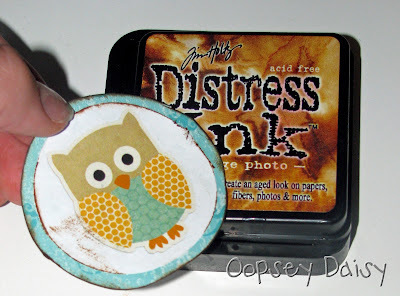 But not before distressing every edge I could get my hands on! 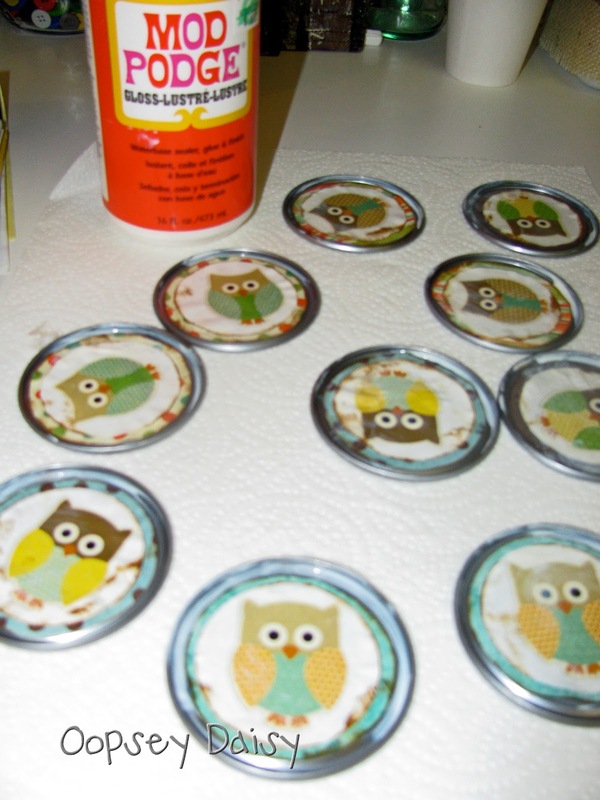 Then, I used mod podge to glue the owls on to my frozen juice lids. 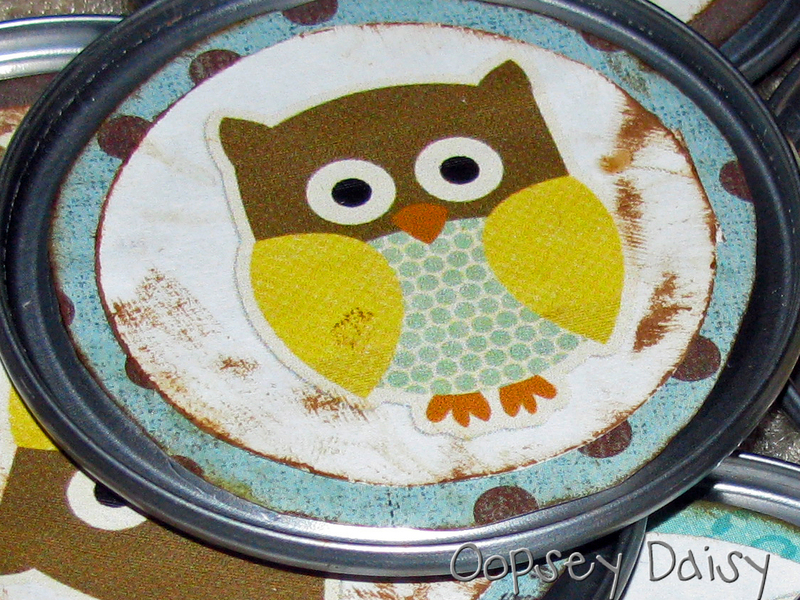 I also added a layer of mod podge over the top to protect those cute lil' owls! Is this little guy cute or what?! I just made 6 matching pairs, so there are 12 owls total. I didn't want to overwhelm poor Little Man! Now we're all set to play memory! 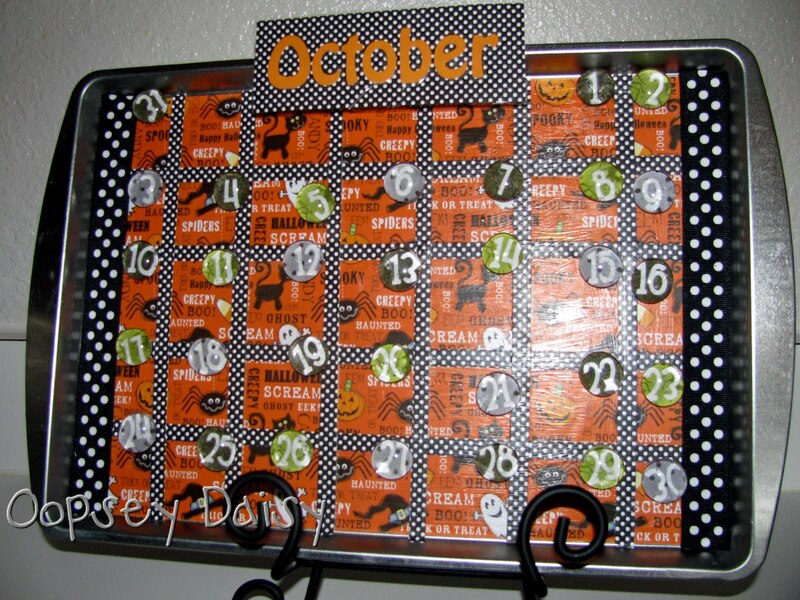 One last thought.... don't forget to bust out your Halloween advent calendars. 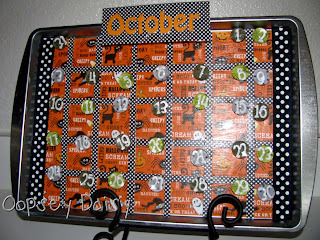 Tomorrow is the first day of October! Bring on the Halloween fun! PS I frequently receive questions via comments. However, I can't reply to your comments because your account preference keeps your e-mail private. You can find out how to change this here in Michele's amazing tutorial. It kills me to leave you hanging!! I try to reply to each and every question! Every fall, I get the itch. It usually hits me around the first week of October. I have to make owl cookies! I remember making these cookies with my Mom and siblings when I was very young, so the memories are as sweet as the cookies. This year, I got the itch just a bit early. I had to include them in our O is for Owls week! You don't want to know how quickly I am gobbling them up! 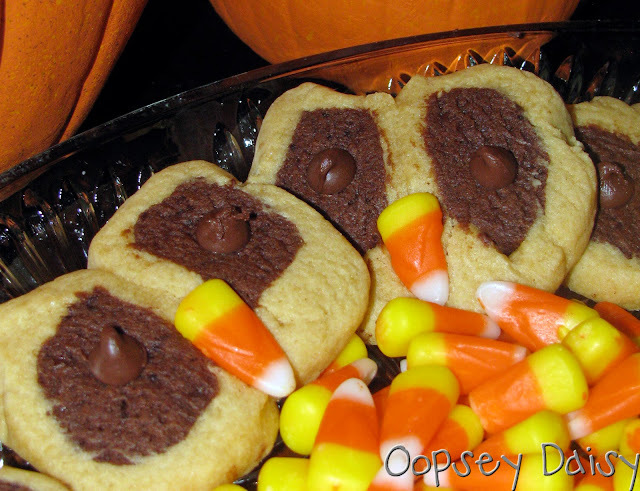 Because besides being cute, these cookies are also delicious! I know, I know, you're dying to make some.... and I just happen to have the recipe! Remember: You don't have to copy this down, you can click to print at the bottom of this post. Blend ingredients together. Take out 2/3 of dough and set aside. 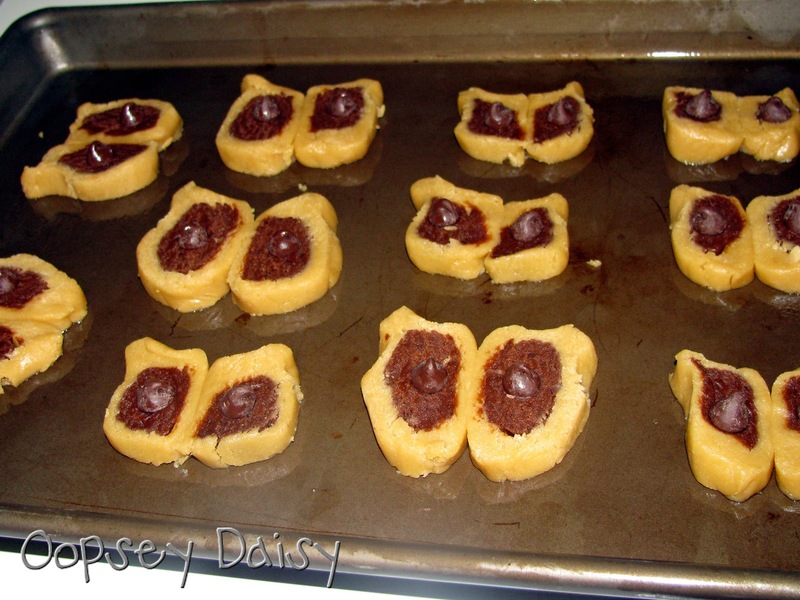 Combine 4 1/2 T. cocoa and 1 1/2 T. margarine with remaining 1/3 of dough. Roll out half of the white dough into a rectangle, about 10 x 4.5. 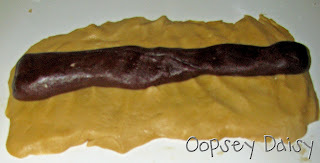 Roll half of chocolate dough into 10" snake. 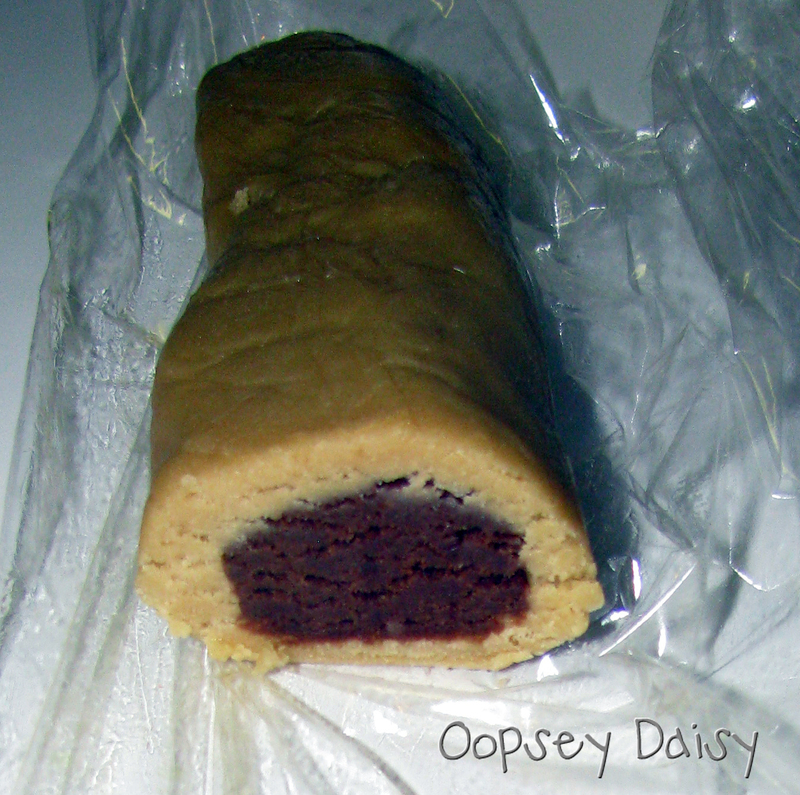 Place the chocolate snake on top of the white dough and roll up. Repeat with remaining dough so you have two rolls. This is what it looks like before you roll it up! Wrap each roll in plastic wrap and refrigerate for 2 hours. Slice into 1/4 inch slices. Place 2 slices together and pinch corners up for ears. Put a chocolate chip in the center of the chocolate pieces for eyes. Bake at 350 for 8 minutes. 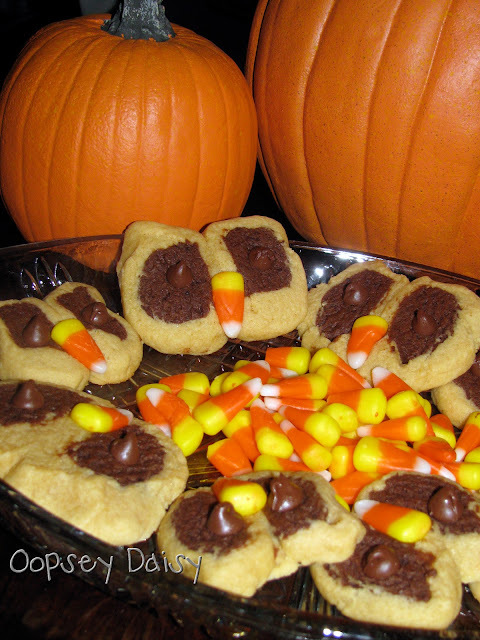 Remove from oven and add candy corn for a beak. Place in the oven for 1 minute longer (NO LONGER!). Be sure to let me know if you try these! This week at Mommy School was so much fun! I admit I wish that O is for owls could continue for another week or so! Owls are perfect for the beginning of the fall season, and I chose the theme partly for me and partly for Little Man. He knows owls and loves to "hoo" his little heart out! And what can I say?! Owls just make me happy, too! Plus, I like to fit my themes and concepts based on what Little Man knows and loves. He recognizes the letter O. (Funny enough, I would always tell him the "O is for olives", and that kind of stuck! He finds an "O" and says "olives!") He also recognizes the color green... not sure why. But this is why I chose the concepts for the week. I love the flexibility of adapting to Little Man's interests! Before I show off all of our fun this week, I wanted to show you how I structure my lesson plans. Each day, I try to be sure to hit all of my concepts: The letter of the week, color/shape, number, nursery rhyme, theme activity, and some kind of story. You can download my plan by clicking here. * Little Hoot by Amy Krouse Rosenthal and Jen Corace. * Owl Babies by Martin Waddell. * The Owl and the Pussycat by Edward Lear. * We made an owl lunch using lunch meat, cheese, crackers, and olives. This was a hit, and we made it a couple of times during the week! * We made owl s'mores. * We created this O is for Owl craft. * Little Man and his cousin made owls using pine cones. * We made an owl puppet. We collected leaves outside to use for the owl's wings. * We used different colors and shapes of buttons to form eyes of an owl. 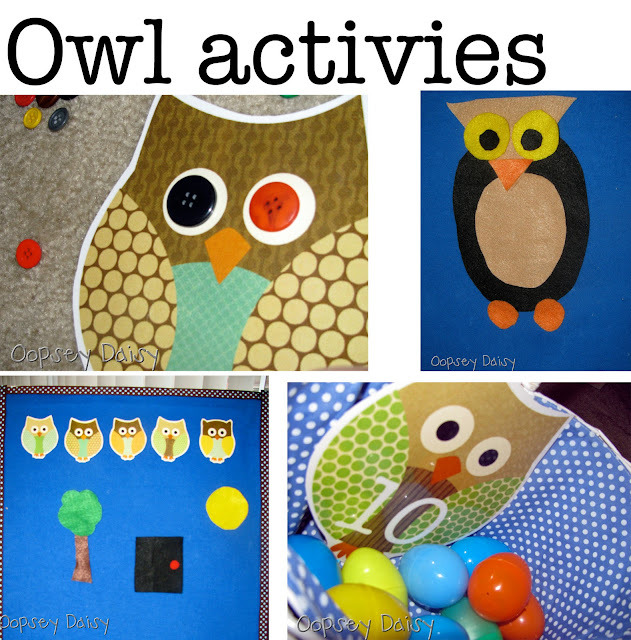 * We used felt shapes to create an owl. * We practiced "One Little Owl" flannel board story throughout the week. * We did an owl counting game using Easter eggs and a basket as a nest. Different owls had different numbers on their bodies, telling us how many eggs to place in the basket. We did some other activities with the letter O, too! * O is for octopus. 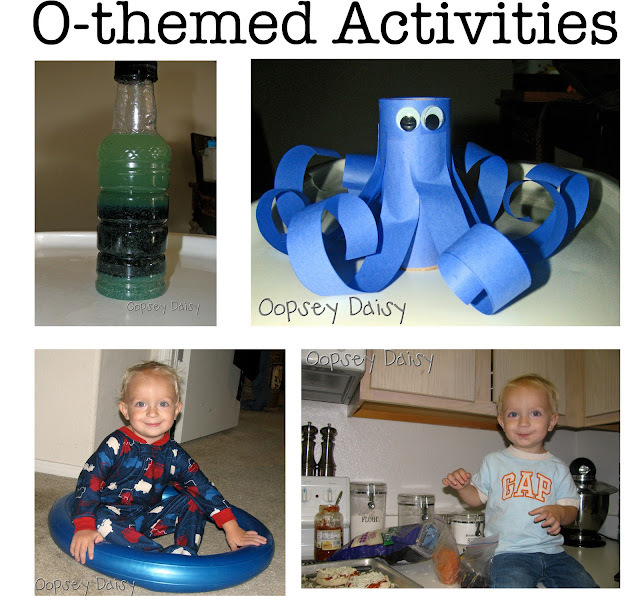 We made an octopus craft using a toilet paper tube and some blue paper. We sang "In an Octopus' Garden." * We found other things that were the same shape as the letter O, like this exercise ball holder. * O is for olives. We made English muffin pizzas with olives, Little Man's favorite ingredient! * O is for oranges. We ate oranges for a snack! * O is for opposites. We learned about opposites using opposites cards. * We made an "O" on the floor with painter's tape and played Ring Around the Rosies on it. Little Man LOVED this! We also did a bean bag toss on the "O" on the floor. * We used window crayons to practice writing the letter O on our windows! 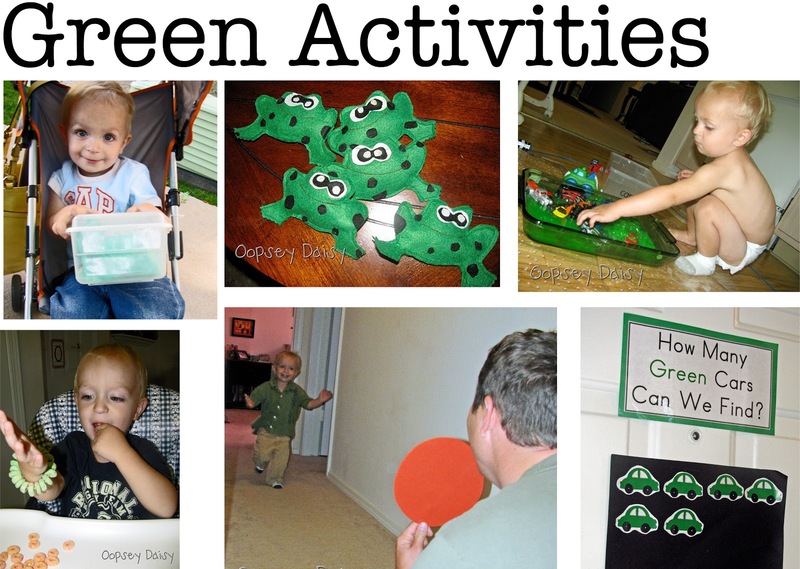 We had A LOT of fun with the color green this week!!! * We went on a nature walk and made a box full of green things we found. 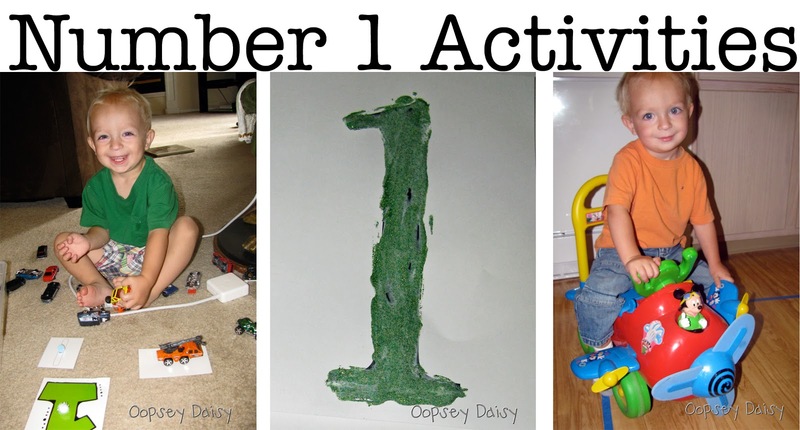 * We used our Five Green and Speckled Frogs to sing the song all week. * I made lime slime jello, and let it set up with matchbox cars inside. Then, Little Man had a sensory experience with the lime slime jello! I had the hardest time convincing him to get dirty here! * We talked about how Apple Jacks looked like the letter "O." Then, we sorted them into green and orange and made a bracelet with green Apple Jacks. * We graphed all of the green cars we saw during the week. I think Little Man's favorite green activity was having the entire family dress in the color green! 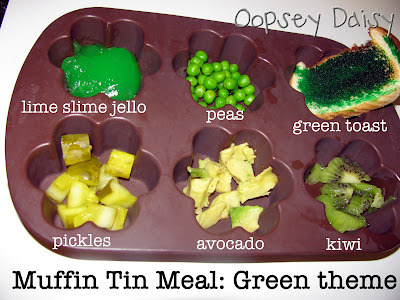 He also enjoyed his green-themed Muffin Tin Meal! * We traced the number one and placed one pompom on the one. We used index cards to count just "one" car. * We used green glitter glue to color the numeral one. * We did several fun "one" songs and games, including a train rhyme, helicopter game, and castle song. In the picture above, Little Man is enjoying riding to the train rhyme. Thanks for the fun e-mails and comments!! 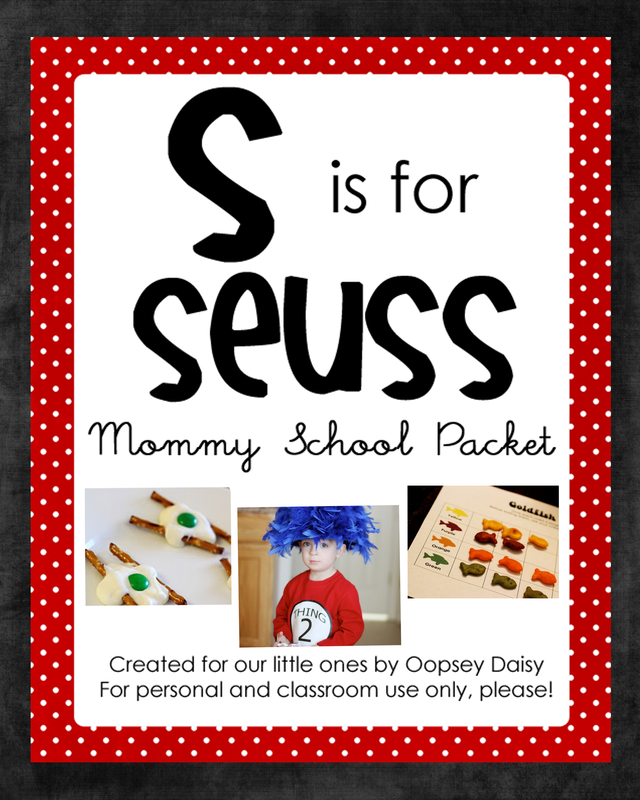 I am thrilled to hear that some of you are starting up your own Mommy Schools at home. Awesome! I bet your kids are loving it!